Is the Feast of Tabernacles commanded in the NEW TESTAMENT? Is there Proof IN THE NEW TESTAMENT that Christ, the apostle Paul and the New Testament Church observed the Feast of Tabernacles? — and Proof that we too are commanded to observe it? 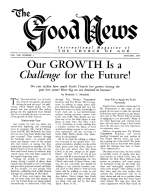 THE CHURCH OF GOD today is a New Testament Church. And in the New Testament is PROOF — astounding proof — that the apostle Paul, the apostle to the Gentiles, kept the Feast of Tabernacles. And PROOF that Christ kept it and that Christ commanded us to do the same! Do We Keep Christ's Words? Jesus declared: "If ye love Me, keep My commandments" (John 14:15). And He said again: "If a man loves Me, he will keep My words" (verse 23). Notice it! If we love Christ we will be keeping not only His commandments, but also His words! Jesus said further. "He that loveth Me NOT keepeth NOT My sayings" (verse 24). Here is the test of whether we are God's Church — the test of whether we love Jesus Christ. If we keep His words and His commandments, we are His Church, His people. This is the teaching of the New Testament, This is New Testament doctrine! But what are Jesus' commandments? What are His words we should be keeping? Do Jesus' commandments and His words require us today to observe the Feast of Tabernacles? Christ's Commandments or the Father's? A commonly assumed idea is that Christ Jesus came in New Testament times to establish different commandments, different teachings from those of the Father. But notice what Jesus Himself said: "The word which ye hear is not Mine, but the Father's which sent Me" (John 14:24). And also: "For I have not spoken of Myself; but the Father which sent Me, He gave Me a commandment, what I should say, and what I should speak" (John 12:49). Jesus spoke nothing contrary to the Father's will. Then what Jesus spoke is according to the Father's will. We are also to be judged by what Jesus spoke. Notice it: "He that rejecteth Me, and receiveth not My words, hath one that judgeth him: the word that I have spoken, the same shall judge him in the last day" (John 12:48). Christians — those who love Christ — are to keep Jesus' commandments and His words. Those who reject His words are to be judged by them in the last day! But do Jesus' words and His commandments include observance of the Feast of Tabernacles? Is keeping the Feast of Tabernacles one of the tests by which we know if we love Jesus Christ? Is keeping this Festival a Now Testament teaching? Live by EVERY Word of God? Consider the teaching of Jesus in Matthew 4:4. "It is written, Man shall not live by bread alone, but by EVERY WORD that proceedeth out of the mouth of God." This is the teaching of the New Testament. These are the very words of Jesus! These are the words which shall judge us! These are the words which Jesus said those who love Him will be keeping. Then it is plain that God's Church is to be living by every word that proceeds out of the mouth of God! Is keeping the Feast of Tabernacles a part of the words which have proceeded out of the mouth of God? Indeed it is! But how can we be sure that God commanded the Feast of Tabernacles for New Testament times as well as for Old Testament times? Is keeping the Feast of Tabernacles part of the New Testament example and teaching of Jesus Christ? Did Jesus ever command men to observe the Festival of Tabernacles or Ingatherings forever? Notice the testimony of Scripture! Who Spoke the Law to Moses? A common assumption is that the Father came personally to Mt. Sinai, spoke the Ten Commandments, commanded the judgments and statutes (which included the requirement to observe God's Festivals) and appeared visibly to Moses. That Jesus Christ the Son did not appear until New Testament times, but when He appeared He abolished all the Father's laws. On this assumption it is argued that Jesus commanded something different than His Father did in the days of Moses and of the patriarches. But this assumption is false! It was not the Father who came to Mt. Sinai and appeared personally to Moses. It was the One who became Jesus Christ who appeared. It was Jesus Christ who, speaking in Moses' day for the Father, commanded the people to observe the Feast of Tabernacles. Those are Jesus' words in the Old Testament and when He reappeared in the New Testament He commanded us to keep His words — He commanded US to live by every word of God! Notice the proof that it was Jesus who commanded His people to observe the Feast of Tabernacles in the Old Testament. Jesus declared in John 6:45-46: "It is written in the prophets, And they shall be all taught of God. Every man therefore that hath heard, and hath learned of the Father, cometh unto Me. Not that any man hath seen the Father, save He which is of God, He hath seen the Father." We are all taught of God, declared Jesus, but no man has ever seen Him except the Son. In other words God the Father has always spoken through agencies and messengers, never directly to any man except to Christ the Son and to His apostles (II Peter 1:17). Compare this with John 5:37. Then it could not have been the Father who spoke to Moses and whom Moses saw. It was Someone Else who commanded the Festivals to our fathers. Paul wrote to the evangelist Timothy that the light and glory of God the Father is such that "no man hath seen, nor can see" until composed of spirit at the resurrection (I Tim. 6:16). But we read in Exodus 24:9-11: "Then went up Moses, and Aaron, Nadab, and Abihu, and seventy of the elders of Israel: and they SAW the God of Israel: and there was under His feet as it were the body of heaven in his clearness. And upon the nobles of the children of Israel He laid not His hand: also they saw God, and did eat and drink" in His presence. This Divine Person could not have been the Father. No man — except Christ — has seen Him! Now understand John 1:18: "No man bath seen God AT ANY TIME; the only begotten Son, which is in the bosom of the Father, He hath declared Him." And I John 4:12: "No man hath seen God the Father at any time." Then Who was it that came down from Heaven to command the people to observe the Festival of Tabernacles forever? Jesus said in John 8:58: "Before Abraham was, I AM!" Jesus existed before Abraham. He said, "I am before Abraham." He did not say, "I was before Abraham," but "I am." In the Greek language in which John was inspired to write, the expression for "I am" is ego eimi. It is the present tense, indicating that Jesus eternally exists. "I am" is the name of the Lord God in Exodus 1:14. Christ is the Lord who spoke to Moses! He is the One who reveals LAW. When Moses asked the NAME of the One who was about to give the law at Sinai, He replied to Moses, "I AM." That is Christ's name. Christ therefore existed before Abraham. He said so! "Before Abraham was, I am." Jesus Christ told Abraham to walk before Him and be perfect. Abraham obeyed. "Because that Abraham obeyed My voice, and kept My charge, My commandments, My statutes, and My laws" (Genesis 26:5). This was not God the Father speaking, because no man ever saw the Father. Abraham and Sarah saw the Lord (Gen. 17:1 and 21:1). This Person must have been Jesus Christ. It was the Lord Jesus Christ who appeared to Abraham. The Lord also appeared to Enoch and to Cain. He appeared to Adam and He appeared to Eve. He appeared to Isaac and to Jacob. But no man has seen the Father at any time. So this Divine Person who spoke in Old Testament times was the One who became the Son. Jesus the Son said, "If you love me, you will keep my commandments." Were Jesus' commandments given to Abraham different from the commandments He gave to Moses — different from the commandments that we observe today? We read that God "changes not" (Malachi 3:6). He is not like men who have human legislatures and must constantly amend their laws. That is man's law. The spiritual laws that God gave are unchanging. Spiritual things do not change as matter does. The laws that man makes change. But not God's spiritual law. God expects us to keep the same commandments Abraham kept. Notice it. He said, "Abraham kept my commandments." Jesus also said, "If you will love me, you [we today] will keep my commandments." Jesus is "the same yesterday [in Abraham's and Moses' day], today [in the apostles' day], and forever" (Hebrews 13:8). Therefore, what He revealed in the New Testament must be in agreement with what He said before, since it is His words that are to judge us! What Are the "Words" of the Lord? Jesus said "If any man love Me, He will keep My word." Now let's turn to the book of Exodus. We all know that chapter 20 of Exodus contains the record of the commandments Jesus Christ spoke to Israel. If we now turn to chapter 23 of the book of Exodus, verses 14 to 16, we find man is commanded to observe certain festivals three times in a year. This includes the Feast of Passover and Unleavened Bread at the beginning of springtime, the Feast of Weeks or the Firstfruits, that is, Pentecost, at the end of springtime, and then, in the fall, the Feasts of Trumpets, Atonement, and Tabernacles or Ingathering, in Exodus 23:16. Here are more than just the Ten Commandments. Here we find specifically, definitely stated, the words of the Lord. Moses told them all the words of the Lord. Remember, Jesus said, "If you will love Me, you will keep My words." If you love Jesus Christ, you will not only be keeping His commandments — won't be committing adultery, you won't be bowing down and serving idols, you will not be stealing and lying to your neighbor, and you will not be observing Sunday, but rather the Sabbath. God loved us first by showing us the way to life, and by making it possible for our sins to be taken out of the way through Christ's blood. In similar manner, we return the same love by obedience to God, by observing the commandments. But Jesus requires more than keeping His commandments. He said, "If you love me you will keep My words." And that included observing the annual Festivals. If you do not observe these days, you do not love Jesus' words! That is New Testament teaching. Jesus was not talking to the Jews of the Old Testament times in John 14:23. He was talking to the apostles of the New Testament Church when He commanded them to KEEP HIS WORDS! So it was the One who became the Son who spoke the words in Exodus 23: "You shall observe a Festival three times in the year" — and that included the Feast of Tabernacles. But many will respond that the command to keep the Feast of Tabernacles is a part of the Old Covenant — and since the Old Covenant was broken, it is no longer necessary to keep the Feast. Consider two facts! The Old Covenant was a marriage agreement (Jeremiah 31:32). If a marriage agreement is broken, that does not abolish the laws that regulate marriages. The laws incorporated in the Old Covenant are like the laws which regulate a marriage covenant. They exist before a marriage agreement and regulate it. Israel's breaking of the Old Covenant did not abolish the laws to which Israel agreed. This brings us to the second fact! The Old Covenant did not institute the Holy Days! The statutes which regulate the annual festivals existed prior to the Old Covenant. What the Old Covenant did not institute it cannot abolish. The Old Covenant was merely a marriage agreement between God (the Husband) and Israel (the wife) in which the wife agreed to obey the Husband's laws which were already in force. In return for obedience, Israel was physically blessed and provided for above all other nations. Notice that the statutes which regulate the Holy Days were required to be kept before the Old Covenant was made! Turn to Exodus 15:26: "If you will diligently hearken unto the voice of the Lord your God, and will do that which is right in His sight, and will give ear unto His commandments, and keep ALL HIS STATUTES, I will put none of these diseases upon you that afflict the Egyptians." Here is the One Who became the Lord Jesus Christ speaking. He is commanding His people to keep all His statutes before the Old Covenant. These statutes could not have been instituted by the Old Covenant because the Old Covenant was not completed until Exodus 24. The statutes which God was revealing to Moses and the people before Sinai were later incorporated into the Old Covenant — just as the weekly Sabbath (Exodus 20). But the Old Covenant did not begin them. The Old Covenant merely included them. Notice that among all the statutes which were in force before Sinai and Inter incorporated into the Old Covenant are the requirements to observe the annual festivals — including the Feast of Tabernacles (Exodus 23:14-17). If the annual festivals had not already been God's laws they could not have been included in the Old Covenant! Here is absolute proof that among the statutes commanded to be kept before the Old Covenant were the laws regulating the annual Holy Days. The weekly Sabbath began with man. It was made at creation (Genesis 2). But the annual festivals God gave first to the Church when the Church began. The twelve tribes of Israel were first formed into a Church — a Congregation or Assembly — IN ORDER TO KEEP THE ANNUAL HOLY DAYS. The first time the word Congregation is used for the tribes of Israel is in Exodus 12:3, where the annual festivals are first introduced! Just as the Sabbath keeps man in a right relationship with his Creator, so the annual Holy Days keep the Church in a right relationship with God. Any group which refuses to keep holy these days God made holy is not in a right relationship with God. Such a group is spiritually like the Egyptians who scoffed at God's festivals! When the Congregation of Israel — the Church in Old Testament times — began to sin (began to be in a wrong relationship with God) and to break these laws, God temporarily added — after the making of the Old Covenant — various physical rituals and sacrifices which were imposed on every day of the year until the coming of Jesus Christ to shed His own blood for our sins (Hebrews 9:10 and Galatians 3:19). These temporary, physical laws did not exist prior to the Old Covenant (Jeremiah 7:22-23). They were given only to the Old Testament Church for a limited duration. Jesus never practiced these ritualistic laws. You cannot find one place in the New Testament where He set us any example to keep them. But He did keep the Feast of Tabernacles as an example for us — and He commanded those who love Him to keep His words, which included the observance of the annual festivals. Now we come to the New Testament. What do we find as its teaching? Were the annual festivals a part of the ceremonial law added "till the seed should come"? Were the Holy Days "nailed to the cross"? After everything was nailed to the cross DO WE STILL FIND THE APOSTLES AND THE NEW TESTAMENT CHURCH OBSERVING THESE DAYS? In I Corinthians 5:8 Paul commands the Gentiles to observe the Feast of Unleavened Bread. "Let us therefore keep the feast," he exhorts the Gentile converts at Corinth. By becoming neglectful of the Feast, the Corinthians were allowing the leaven of sin to creep into their midst. Notice what this means. Either Paul was not the apostle of Jesus Christ and was trying to re-establish what was already abolished, or else the laws regulating the festivals were not abolished at the cross! Isn't that plain. Paul would have been without any authority whatsoever to command these Gentile converts to "keep the feast" unless it was still God's law to keep the Holy Days of God. Now notice the examples of Paul himself planning to keep an annual festival. The first is found in Acts 20:16. Paul is rushing by Ephesus in order to be at Jerusalem. Why does Paul want to be at Jerusalem? — in order to preach to the Jews? Not at all! Notice how this verse reads: "For Paul had determined to sail by Ephesus, because he would not spend the time in Asia: for he hasted, if it were possible for him, TO KEEP the day of Pentecost at Jerusalem." Paul was determined to KEEP the day of Pentecost with the Headquarters Church before launching on a campaign into Spain. Many translations obscure the real meaning of this verse. The original, inspired Greek word here translated "to keep" is genesthai, which is an infinitive form of ginomai. The King James and other versions incorrectly render it "to be." The Greek word for "to be" is einai, but Luke was inspired to use genesthai here in Acts 20:16 which can mean among other things "to keep, to celebrate, or to solemnize a festival" according to the Analytical Greek Lexicon. This same root word is used in Matthew 26:2, which ought to be translated: "Ye know that after two days the Passover is celebrated . . ."
So here we have two important examples of Paul — 1) commanding the Gentiles to observe the Days of Unleavened Bread and 2) planning to KEEP the day of Pentecost with the Headquarters Church at Jerusalem. But what New Testament examples are there for keeping the Feast of Tabernacles? We have two ways of knowing what Christians ought to do. One is by the examples of Scripture, the other is by explicit command of the Scripture. We have already seen that Christ gave an explicit command in the New Testament that we should keep His words — that His words included the keeping of the annual festivals. Now let us turn to the examples of Scripture to see if Jesus and Paul kept the Feast of Tabernacles. Turn, first, to I John 2:4-6. "He that saith, I know Him and keepeth not His commands, is a liar, and the truth is not in him. But whoso KEEPETH HIS WORD, in him verily is the love of God perfected: hereby know we that we are in him. He that saith he abideth in Him ought himself also so to walk, even as He walked." Notice that the apostle John teaches us to keep the words of Jesus and to follow the example of Christ. What was Christ's example? The last autumn before He died, Jesus went up to Jerusalem to observe the Feast of Tabernacles! The entire seventh chapter of the Gospel according to John is devoted to what Jesus said and did at that Festival. Because of the Jews, Jesus did not go to Jerusalem with his family, but separate from them (verses 8 and 10). He did not appear publicly to teach in the temple until the middle of the Feast of Tabernacles (verse 14). John records parts of the sermon of Christ delivered on the last great day of the Feast in 30 A.D., beginning with verse 37. Paul obeyed Jesus Christ. Paul kept the Holy Days Jesus commanded. That included the Fast of Tabernacles. Where, in Scripture, do we find Paul keeping this festival? Turn to the book of Acts for the answer! God used Paul to reach the Gentiles with the Gospel. In 50 A.D., Paul crossed over from Asia into Europe and began to preach the gospel at Philippi "on the day of weeks" — Pentecost — according to the original Greek (Acts 16:13). Most versions improperly render the Greek expression "on the sabbath day"; but the original inspired Greek means Pentecost. This was exactly 19 years to the day since the Holy Spirit came in 31 A.D. (Acts 2). After a few weeks at Philippi, Thessalonica (Acts 17:1), Berea (Acts 17:10) and at Athens (verse 16), Paul came to Corinth in the late summer of 50 A.D. After spending several sabbaths teaching in the synagogue (Acts 18:4), Paul continued to hold meetings in the house of Titius Justus (verse 7) for "a year and six months" (verse 11). This brings us to the spring of 52 A.D.
After a riot stirred up against the Apostle was quelled, we read the following about Paul: "And Paul after this tarried there a good while, and then took his leave of the brethren, and sailed thence into Syria" (Acts 18:18). It must now have been well into the summer of A.D. 52. The Days of Unleavened Bread and Pentecost — the two festivals near the beginning and end of spring — were now past. To continue with Paul's journey. On his way from Corinth to the port of Syria, "he came to Ephesus" and "entered into the synagogue, and reasoned with the Jews. When they desired him to tarry longer time with them, he consented not; but bade them farewell, saying, I MUST BY ALL MEANS KEEP THIS FEAST THAT COMETH IN JERUSALEM: but I will return again unto you, if God will. And he sailed from Ephesus" (Acts 18:19-21). Paul planning to keep the feast with the Headquarters Church at Jerusalem? Indeed! That is what the Scripture says! Which Feast? Obviously the Feast of Tabernacles! The spring festivals were already past. The two late summer or early autumn Holy Days, Trumpets and Atonement, could be held at any of the local congregations. Here was a major festival being held at Jerusalem in the autumn. The only major festival that occurs in the autumn is the Feast of Tabernacles! Paul told the Ephesians that he "must by all means keep this feast" with the Headquarters Church in Jerusalem. Paul had just completed his first journey into Europe with the gospel. He felt he had to report the progress of the work to the Headquarters Church and the brethren in Palestine (verse 22). What better time than to do so while keeping the Feast of Tabernacles! Here is the example of Paul the apostle to the Gentiles. After years in the ministry he is still KEEPING THE FEAST OF TABERNACLES. Acts 18:21 appears correctly in the King James Version of the Bible. But numerous modern versions leave out that portion of the verse which tells of Paul's intention to keep the Feast. This verse, in its entirety, belongs in the Bible. It has always been in the Greek "Received Text" — which is the inspired text handed down to the Greek speaking world by the original true Church of God. The Overwhelming majority of Greek Manuscripts have this verse in it. The only manuscripts which leave it out are those copied in Egypt and in the Latin speaking portions of the Roman Empire. There would have been no reason to add this verse to the Bible if it were not there originally. BUT THERE IS EVERY REASON WHY MEN WOULD LIKE TO REMOVE IT FROM THE INSPIRED TEXT! The Catholic version of the Bible leaves it out as do almost all modern Protestant versions of the Bible. But these are just the churches who do not want to keep this feast! Here, brethren, is proof from the New Testament — from Christ's teaching and example, and the apostle Paul's example — that the New Testament Church is commanded to keep the Feast of Tabernacles. How plain the Scripture is when we are willing to believe and practice what it reveals!